Banks, real estate, telecoms show biggest Chinese influence. What a difference 20 years makes. Back when Hong Kong reverted to Chinese sovereignty in 1997, the British colony’s economy was dominated by homegrown tycoons such as Li Ka-shing and colonial-era conglomerates such as Jardine Matheson Holdings Ltd., whose influence dates back to the Opium Wars. Now, in 2017, a new sheriff is coming to town, so to speak. While Li and his peers are still big, the influence of local tycoons in parts of Hong Kong’s economy is waning while that of mainland Chinese companies is surging—especially in finance, real estate and telecommunications. China’s prevalence continues to grow in other sectors as well. Hong Kong has long acted as the gateway into and out of China. In the ’90s, Chinese state-owned firms, known as Red Chips, raised capital from Hong Kong to develop China’s economy. Now, as China’s political influence in Hong Kong grows, cash-rich Chinese firms are gaining more influence in the economy as well. In a city where financial services make up almost 18 percent of the economy, Chinese companies are now everywhere. From not even appearing on the list of top 10 arrangers of initial public offerings back in 1997, the likes of China Construction Bank Corp.and Haitong Securities Co. now dominate as sponsors in Hong Kong’s market, one of the world’s biggest. About $5 billion of funds were raised from IPOs in the city so far this year, compared with $3.4 billion in all of 1997. 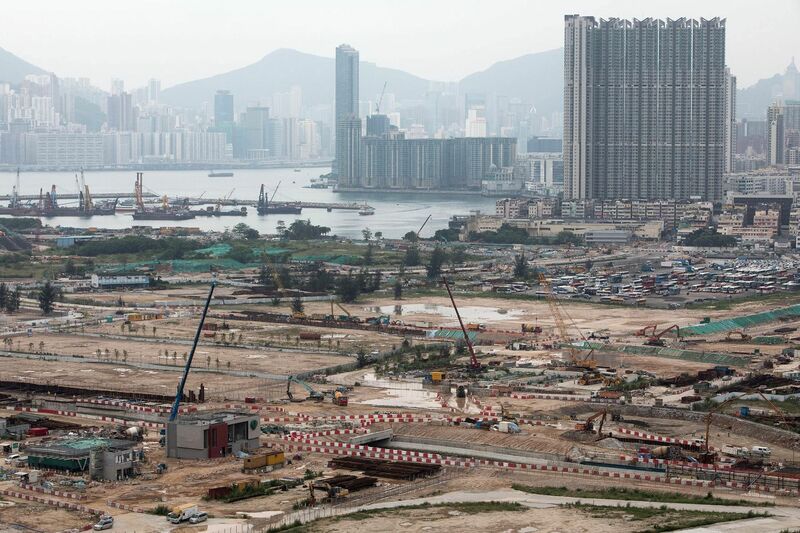 Chinese developers, including HNA Group Co. and Logan Property Holdings Co., have outbid local contenders for expensive land for development, snapping up all HK$37 billion worth of government land sold for residential development this year. Local developers? Zero. Hong Kong developers, such as Henderson Land Development Co., have stuck to bidding for commercial real estate instead. They’re increasingly seen in the phone market, too, with a unit of China Telecom Corp.planning to launch mobile services this month. And in media ownership—with the city’s premier English-language newspaper, the South China Morning Post, purchased last year by Chinese billionaire Jack Ma with the stated intent of presenting a view of China that’s more Chinese-influenced than Western. In 1997, Morgan Stanley, HSBC Holdings Plc and Merrill Lynch were the leading underwriters of IPOs in Hong Kong on a top 10 list made up of only local and global firms, according to data compiled by Bloomberg. Now, nine out of 10 are mainland Chinese, with China Construction Bank Corp., Haitong Securities Co. and Agricultural Bank of China Ltd. atop the list. To win market share, Chinese investment bankers have driven down fees. For some IPOs, especially high-profile deals, advisers are paid just half of what they used to get five years ago—just 1 percent of the value of the deal. 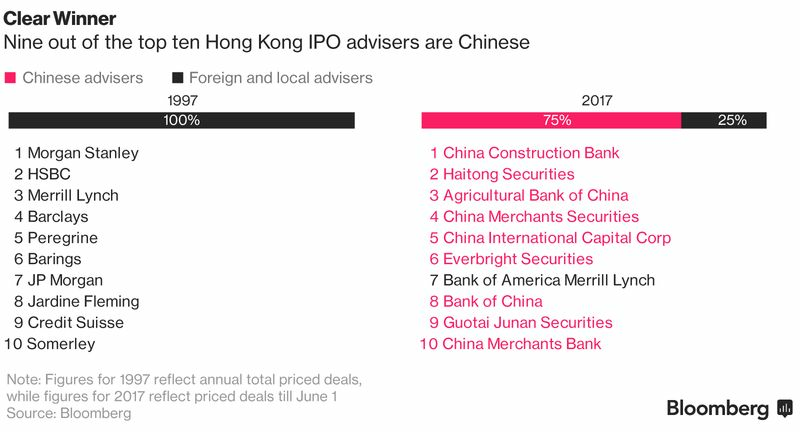 The shift coincides with more and more Chinese companies vying to go public in Hong Kong as a cornerstone for global expansion. Now, virtually all new listings on Hong Kong’s exchange are of China-origin companies, a change from six years ago when the exchange lured global companies such as Prada SpA and Samsonite International SA. 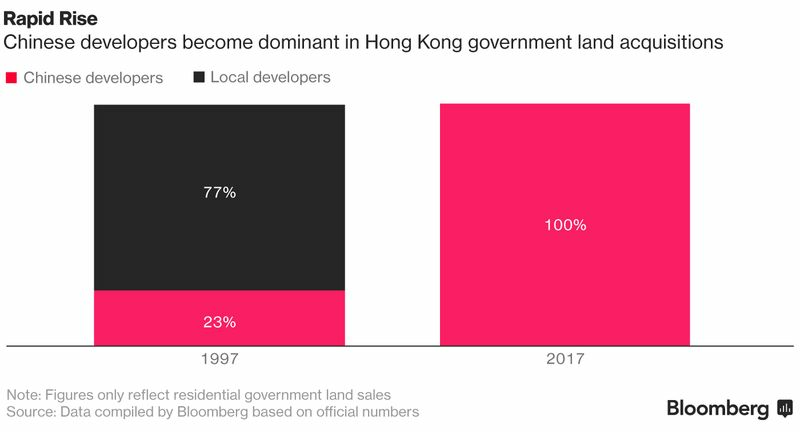 Mainland developers started outbidding Hong Kong property billionaires, who once dominated the buying of government land to develop residential housing, in 2011. This year, Chinese buyers snapped up all residential plots, extending their streak from last year when they put almost half of such sales into their pockets. HNA, led by Chinese aviation tycoon Chen Feng, has been especially active. The owner of Hainan Airlines Holding Co. spent a total HK$27.2 billion on four sites at the former Kai Tak airport since late last year. In its very first foray into the city in November, HNA beat 19 bidders with a record HK$8.84 billion offer. Hong Kong’s de facto central bank has now weighed in and placed restrictions on bank borrowing for construction and land purchases. That will affect many mainland Chinese developers who take on more debt than local firms to buy land, but it’s unlikely to stop the trend of local developers losing out to Chinese firms. After several rounds of consolidation of mobile-phone operators, China Mobile Ltd. debuted in 2006 onto a scene that previously had no mainland operators. China’s largest wireless carrier acquired China Resources Peoples Telephone Co. Ltd., then controlled by a mainland conglomerate. 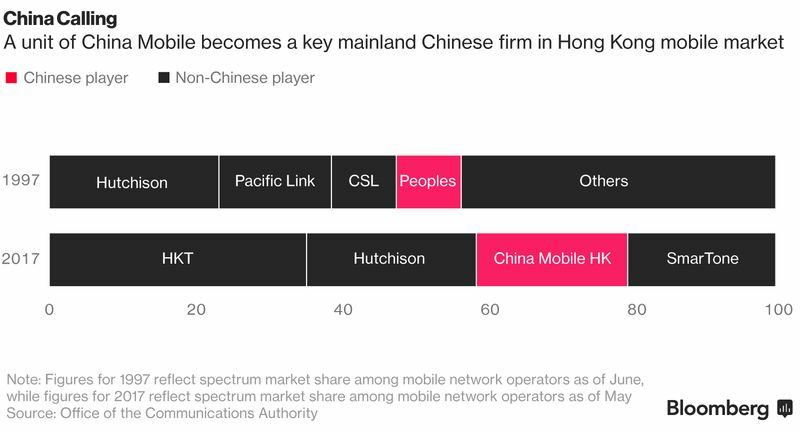 China Mobile now owns a fifth of Hong Kong’s commercial phone airwaves. It shares the space with firms owned by local tycoons, including Sun Hung Kai Properties’ Kwok family, CK Hutchison Holdings Ltd’s Li Ka-shing and his son, Richard Li. Another Chinese player, China Telecom, is also planning to launch mobile services in the city in June, while China Unicom (Hong Kong) Ltd. began providing service in Hong Kong 15 years ago. As Chinese firms move in, local companies are increasingly looking out. While Li’s Hutchison Whampoa generated 69 percent of its earnings from Hong Kong businesses back in 1997, his flagship firm today—CK Hutchison—garnered just 3 percent of earnings from Hong Kong last year after investments in Europe and Australia. Those moves have drawn criticism that he’s abandoning the city that made him its wealthiest man—a charge he has denied. Chow Tai Fook Enterprises Ltd., the Hong Kong property and jewelry conglomerate owned by the Cheng family, recently acquired an Australian gas company, Alinta, in its foray into Australian utilities.